Northern Ireland History,the Northern Ireland Troubles,and conflict in Northern Ireland. Explains the causes of the conflict in Northern Ireland. It also looks at Irish History and helps to explain the continued conflict. The Orange Order in the north of Ireland started to react to this ever changing political scene and became revitalised once again. Their minds turned to the Battle of the Boyne and Unionists became determined that their history would not be undermined. 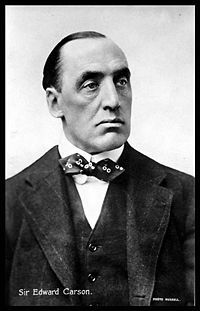 Sir Edward Carson , a Dublin born lawyer, had been Solicitor General for Ireland, Attorney General in Britain and First Lord of the Admirality and in 1918 sat for a Belfast constituency. As leader of the Unionist Party from 1910 he was a prominent organiser of campaigns against Home Rule and especially the Ulster Volunteers. He believed that the whole of Ireland should remain a full and integrated part of the United Kingdom. In 1911 he told a huge rally that Home Rule would be resisted and that if the Home Rule Bill became law, the Unionist Members of Parliament would set up a government for the province of Ulster. His thinking behind this was that John Redmond would not agree to only part of Ireland becoming separate from the United Kingdom, and if Carson could prevent it in Ulster, then Redmond would abandon the Home Rule Bill. In January 1912, the unionists had organised the Ulster Volunteer Force (UVF), a huge military force, and a meeting was held in Belfast in September. A petition known as the “Ulster Solemn League and Covenant ” was signed by 200,000 people across the north. In that petition they pledged that they would “Use all means which may be necessary to defeat the present conspiracy to set up a Home Rule parliament in Ireland”. By Ulster they meant the nine counties and what was surprising was that half of Ulster was Catholic. In 1913 the UVF had over 100,000 members and around 24,000 rifles were brought in to Larne. The government of the day allowed this to carry on as they did not view the UVF as a threat to the British Empire. In 1914 a boat load of arms landed in Northern Ireland and the UVF became a force to be reckoned with. Despite the fierce resistance a Bill was passed through the parliamentary stages but was postponed by the onset of the First World War. In 1913, the Irish Republican Brotherhood (IRB) also started to become more active. They held a public meeting at the Rotunda in Dublin. Thomas J. Clarke had returned from America and began to organise the IRB, taking members from Sinn Fein, who at that time were an ideological group rather than a military one. How Did Northern Ireland Split From Ireland?